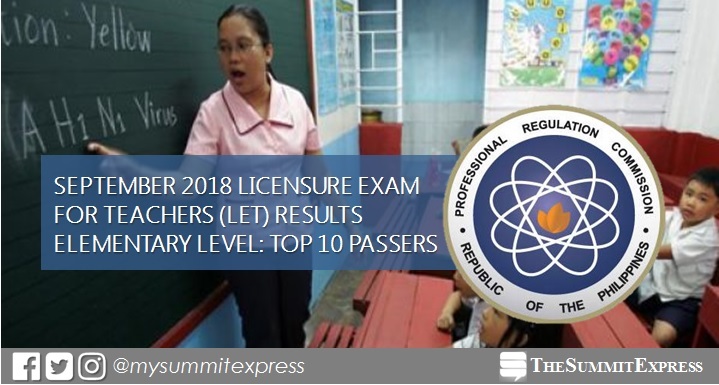 MANILA, Philippines – The full list of topnotchers or top 10 passers in the September 2018 Licensure Exam for Teachers (LET) or teachers board exam is available on this page as released today, December 7 or in 47 working days after the examinations. Those awaiting the results for Elementary Level may view here the name of successful examinees who garnered the highest places for September 2018 LET board exams. This includes the rank, school and average rating. A total of 90,750 Elementary Level - Education graduates took the licensure exam in 25 different testing centers nationwide: Baguio, Bacolod, Cagayan de Oro (CDO), Catarman (Northern Samar), Cebu, Davao, General Santos, Iloilo, Laoag, Legaspi, Lucena, Manila, Rosales (Pangasinan), Tacloban, Tuguegarao, Pagadian, Zamboanga, Occidental Mindoro, Oriental Mindoro, Romblon, Kidapawan, Boac, Palawan and Masbate City. In the same period last year, a total of 41 examinees were included in the top 10 passers for Elementary level. Mary Clarence Gepes Madero of West Visayas State University (WVSU) - La Paz aced the board with 88.80%. In the September 2016 examinations, 65 names were hailed entering the top 10. Mark Penuliar Castillo of Tarlac State University (TSU) and Lady Princess Sanguyo Marcelo of University of the Philippines (UP) - Diliman tied on highest spot with 88.20%. In September 2015 LET, there were 71 topnotchers occupied the list. Paulo Icaranom Bernardino of Catanduanes State University (CSU) - Virac and Pauline Joviene Dizon Quiazon of Angeles University Foundation (AUF) topped the board with identical 87.20-percent grade.